What is Helen O’Grady International’s Youth Theatre? Youth theatre is a developmental drama programme developed by Helen O’Grady International. Its objective is to encourage young people to express themselves creatively while developing interpersonal and communication skills. The curriculum uses our unique Helen O’ Grady Drama system with its specialised techniques to facilitate personal growth and promote thinking skills in students pursuing all the university accredited degree and certification programmes. What does Youth Theatre do? Youth Theatre employs elements of role-play, theatre games, group-dynamics games, mime, improvisation, vox pops, snippets, speech dynamics, quick fire dialogues, expression exercises, space and body awareness, etc. in a progressive educational model through an intensive format which focusses on developing imagination, creativity and spontaneity. Why is there a need for such a programme? Youth are at a critical formative and impressionistic stage of their lives and their experiences, learning, choices and social atmosphere impact their growth. Through Developmental Drama, they find themselves in a simulation of real life situations where all their responses and reactions can be recorded and assessed. It is absolutely necessary that they become good communicators in today’s world and this can happen through self-realisation. This leads to development of self–esteem, self–confidence, creative thinking and problem solving abilities among the young adults. Their inter-personal & intra–personal skills need to be honed, which will stimulate their creative self and allow them to enjoy the freedom to experiment leading to a harmonious life pattern. How has Youth Theatre evolved? Helen O’Grady International, over a period of 35 years, has developed a curriculum through intensive educational research on the needs and requirements of the young people studying in diverse academic streams. 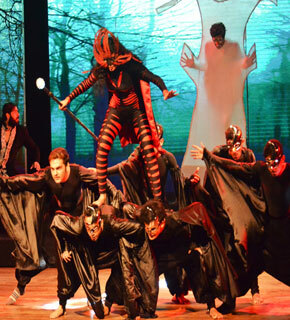 How are the Youth Theatre classes conducted? Youth Theatre modules can be conducted either through weekly classes of 2 hours each for 15/20/25 weeks or in a workshop format of 3 to 5 hours every day for 5/10/15 days. University life of students involves various stress factors caused by long hours of study, project work, academic and assessment related pressures. Our Youth Theatre Programme works as a stress buster and enables the students to channelise their anxiety, fears, anger, disappointments into positive emotions and achievements. They learn to cope with failures and successes with equanimity. How does the Youth Theatre programme help in furthering the future prospects of young people? Youth Theatre helps in moulding the personality of young people to cope with the competitions and face interviews with confidence through enhanced body poise, social skills, eye contact, public speaking skills, presentation skills, leadership roles in group discussions and an eloquent personality.